The nervous system is a biological system that regulates the body's responses to internal and external stimuli by carrying information to and from all parts of the body through a vast network of nerve cells. Nervous tissue is found in the brain, spinal cord, and nerves. It is responsible for coordinating and controlling many body activities. It stimulates muscle contraction, creates an awareness of the environment, and plays a major role in emotions, memory, and reasoning. To do all these things, cells in nervous tissue need to be able to communicate with each other by way of electrical nerve impulses. The cells in nervous tissue that generate and conduct impulses are called neurons or nerve cells. 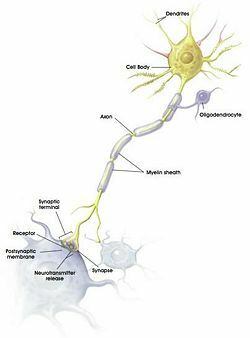 Neurons consist of a large cell body and elongated extensions called axons used for sending impulses, and usually dendrites for receiving impulses. Normally, nerves transmit impulses electrically in one direction, from the impulse-sending axon of one nerve cell to the impulse-receiving dendrites of the next nerve cell. The information the dendrites received can cause the cell body to generate a nerve impulse. Axon terminal is a swelling at the tip of each of the tiny nerve endings. Where an axon terminal comes close to another cell, the membranes of both cells are modified to from a synapse. (Purse, p846) The axon secretes tiny amounts of chemical messengers called neurotransmitters. Neurotransmitters trigger the receptors on the next nerve cell's dendrites to start up a new electrical current. Different types of nerves use different neurotransmitters to transmit impulses across the synapses. 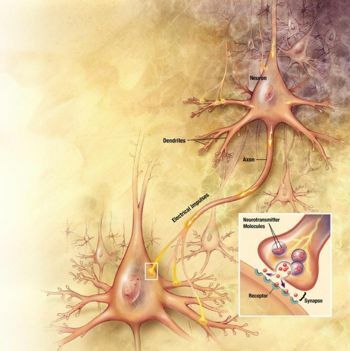 Nervous tissue also includes cells that do not transmit impulses, but instead support the activities of the neurons. These are the glial cells (neuroglial cells), together termed the neuroglia. Supporting, or glia, cells bind neurons together and insulate the neurons. Some are phagocytic and protect against bacterial invasion, while others provide nutrients by binding blood vessels to the neurons. 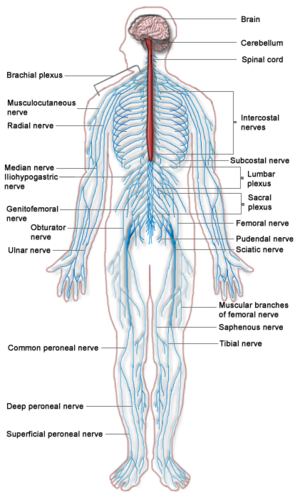 The nervous system has two basic parts: the central nervous system (CNS) and the peripheral nervous system. The CNS includes the brain and spinal cord, and the peripheral nervous system includes the nerves outside the CNS (i.e. motor and sensory system functions). The Neuron. When sufficient neurotransmitters cross synapses and bind receptors on the neuronal cell body and dendrites, the neuron sends an electrical signal down its axon to synaptic terminals, which in turn release neurotransmitters into the synapse that affects the following neuron. To transmit these messages, charged particles (primarily sodium ions), jet across a nerve cell membrane, creating an electrical impulse that speeds down the axon. When the electrical impulse reaches the end of the axon, it triggers the neuron to release a chemical messenger (called a neurotransmitter) that passes the signal to a neighboring nerve cell. This continues until the message reaches its destination, usually in the brain, spinal cord, or muscle. Axon terminal is a swelling at the tip of each nerve ending, and comes very close to the target cell. A synapse is where the axon terminal comes close to the other, and modifies the membranes of both cells. Axon terminals synapse with a target cell. Neurotransmitters are stored in the axon terminal and released when a nerve impulse arriving at an axon terminal, then it diffuses across the space and binds to the receptors on the plasma membrane of the target cell. Simple electrical concepts underlie neuronal function. Voltage is the tendency for electrically charged particles like electrons or ions to move between two points. As we know, voltage is to the flow of electrically charged particles, if the negative and the positive poles of a battery by a copper wire, then the electrons will flow from the negative to positive because there is a voltage difference between them. The inside of the cells are electrically negative in comparison to the outside. The membrane potential is the difference in the voltage which is across the plasma membrane of a cell. And in an unstimulated neuron, this voltage difference is called a resting potential. Electrodes can measures the membrane potentials. If a pair of electrodes is placed one on each side of the plasma membrane of a resting axon, they may measure a voltage difference of about 60 millivolts. The resting potential may change when a neuron is stimulus, because neurons are sensitive to any chemical or physical factor. And the most extreme change in membrane potential is an action potential, which is a sudden and rapid reversal in the voltage across a portion of the plasma membrane. For 1 or 2 milliseconds, a bioelectric current crosses the membrane and the inside of the cell will become more positive than the outside. The action potentials that moves along axons called nerve impulses. Neurons transfected with a disease-associated version of huntingtin, the protein that causes Huntington's disease. 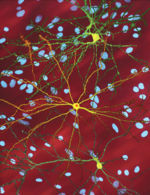 Nuclei of untransfected neurons are seen in the background (blue). The neuron in the center (yellow) contains an abnormal intracellular accumulation of huntingtin called an inclusion body (orange). The nervous system is an very complex communication system, which can send and receive voluminous amounts of information at one time. However, the system is vulnerable to diseases and injuries. For example, nerves can degenerate, causing Alzheimer's disease or Parkinson's disease. Bacteria or viruses can infect the brain or spinal cord, causing encephalitis or meningitis. A blockage in the blood supply to the brain can cause a stroke. Injuries or tumors can cause structural damage to the brain or spinal cord. ↑ 1.0 1.1 Nervous Tissue SEER Training Modules, National Cancer Institute. THE NERVOUS SYSTEM by M.J. Farabee. Estrella Mountain Community College.